Lockwood was our destination as 25 of us set off on our annual bus trip. How nice to have Whitmore’s bus coach captain to be our driver and negotiate around the area even to reverse in a tight spot when we couldn’t pass over the bridge with the 5 ton limit. Project coordinator from the Mid Loddon Landcare Network, Judy Crocker met us at the Happy Jacks store to conduct us on the days outing. Our morning tour included a drive around the lifestyle properties and subdivision that has progressed in these valleys. Houses everywhere, some on 20 ac then 10ac and even 8ac is now on offer at considerable elevated prices. Most have plantings of native species which create an increase in the extent, condition, connectivity and resilience of native habitat. We stopped at Fred & Joanna Brunings who have owned their 25 acre retirement property for about 10 years where most of the open paddocks have been planted for greater biodiversity within the surrounding farm land. This little haven with its own dry creek has been created over the past eight years. We were impressed with their success with direct seeding considering the climate variability and rabbit problem. Now it was interesting to note that this couple took inspiration from one of Bill Twigg’s farm tours – so they were delighted that Bill was there in person. Our group was inspired by the use of an alternate wire tree guard which gave greater protection from rabbits while giving support to saplings. Note : A very excited Fred told Judy today that his dam is full and almost overflowing and the drainage line that feeds it is still flowing and life is wonderful. Our lunch stop was at the Lockwood recreational reserve which has wonderful modern facilities along a creek where the groups have eradicated invasive weeds and planted native understory to make a welcoming rest area. The BBQ was soon in action with the sausages, hamburgers and chicken lovely and hot overseen by Robert and David. Afternoon saw us heading to the Lockwood State Forest stopping to view the exclusion plots. It was clearly evident that the plants were protected from the rabbits and kangaroos showing good growth even in these low rainfall years. The understory is quite diverse where saplings have been thinned and a good opportunity to see the leafless current bush and the first golden wattle blooms. Then on the Gill’s curlew project where they have fenced a large corner area, imported logs from roadside works to enhance and encourage the retention of litter. When funding is available for materials the 2mt feral fence will be completed. One edge of the site had been direct seeded for wind protection and it was pretty lush and quite diverse, with just a few tall gums in the species selected. A main highlight of the day proved to be when Noreen Gill brought out the curlew puppet with sound effects reinforcing the call of the curlew that we haven’t heard for probably 40 years. Out to the broad acre farms where erosion has been an ongoing problem created by loss of forest, land clearing and tree cover. Mr Howard Hepburn rolled out the 1960’s map on the bonnet of the Ute displaying the plan that was set up to control the water flow causing massive erosion. Being implemented some 40 to 50 years ago the system was in need of rejuvenation. MLLN has sourced funds to repair and restore fences, plant trees and renovate the out flows of control flow dams. It was an impressive site to view the valley and works in progress to slow the water trying to minimize water erosion the evidence we could see as the bus toured further farm areas. Farm lands have been used to improve habitat for threatened species, planting biodiversity corridors that have a dual action as wind breaks protect and enhance remnant vegetation to support sustainable agriculture in practice. Wind breaks of 8 to 10 meters were still being approved when most recent funding requires a minimum of 30mt corridors was something to take home as a bit of a question for SWLG to analyze options for corridor plantings. Visitors from the Inglewood Landcare Group, Mt Korong Landcare and Friends of Kooyoora joined us for the outing all learning just the right conditions to encourage the return of the curlew. 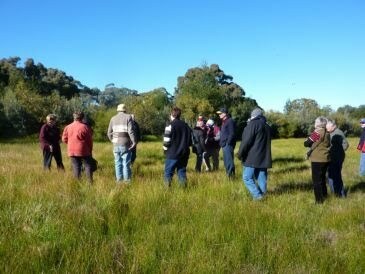 Hopefully actions within their groups will reflect some of this practical knowledge on biodiversity, pest plant and animal eradication and sustainable farm and land management practices. An immediate outcome from the tour is the manufacture of wire tree guards by Rodwell’s Wire Works in Inglewood which will be put to good use in this year’s planting especially on sites where rabbits are evident near the river. For maximum learning to be effective it’s great if all the five senses can be activated. There was plenty to see, the smell of the bush was invigorating, the crunch of litter underfoot really brought home what conditions endangered species need, then the taste of the delicious food with the sound of the curlew to complete the experience. It’s interesting to note that similar conditions are needed for the Hooded Robin a declined species in our area. President Robert Condliffe thanked Judy for a great insight, allowing us into the back blocks of an area we often pass on our way to Melbourne. Jean, you’ve done it again, getting us into a region that reflects our commitment to protect the environment. It was encouraging to see the works of volunteers, owners and landholder’s efforts are taking positive action to increase biodiversity and minimize soil degradation in a higher rainfall region to protect our natural environment.